-ocityishness :: eventually a suffix will get you there. : You Save Lives, I Do Amusing Things to Our Dogs. So? You Save Lives, I Do Amusing Things to Our Dogs. So? I have no one to talk to while the DNB is on call. The Buds and I go upstairs, where I start to read. Noticing that Aikane is fluffing blankets and arranging pillows to get comfortable on the bed, I get a brilliant idea. 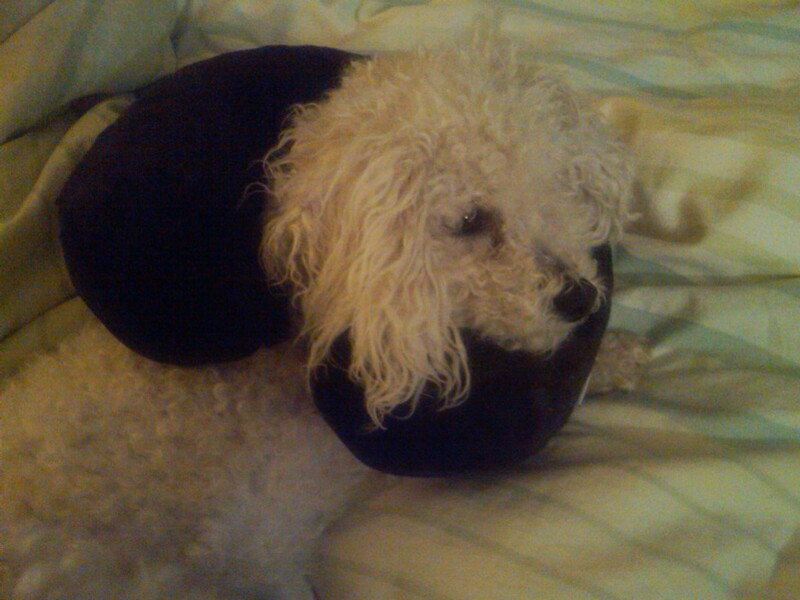 The travel neck pillow! "Look!" I text the DNB, sending him a photo of my handiwork. "BABY!" I try again. "Look at the picture!" "It's so cute! I think he thinks he can't move with it on. It's ADORABLE!" Then, "Oh cute," he finally replies. "I might be putting a kid on ECMO tonight," he continues. Extracorporeal membrane oxygenation. Like a heart-lung machine. "I feel like you're trying to one-up my Aikane Neck Pillow."